The MakeHole command projects selected closed curves to a surface or polysurface to define hole shapes. Pick the cut depth point, or press Enter to cut through object. Constrains the direction for the hole extrusion to x, y, or z.
Constrains the direction for the hole extrusion to the curve plane normal. Constrains the direction for the hole extrusion to the construction plane z direction. Constrains the direction for the hole extrusion along a curve. The PlaceHole command projects a closed curve to a surface or polysurface to define a hole shape with a specified depth and rotation. Select a closed planar curve. Pick a base point for hole. Select a surface for the hole. Changes the default hole depth. Cuts the hole completely through the solid. The Depth setting is ignored. Sets the angle of the hole. The RoundHole command creates circular holes in surfaces or polysurfaces. Pick a center point on the surface, or specify a command line option. Radius or diameter of the hole. Sets the angle at the bottom of the hole. If the angle is 180 degrees, the hole bottom is flat. If the target , such as a plane, does not have a "far side" Through=Yes will trim a hole in the surface. If Through=No, the sides and bottom of the hole will be made. Specifies the direction for the hole. Uses the surface normal direction. Draws the hole perpendicular to the active construction plane. Two points establish the extrusion direction angle. Pick a second point to establish the direction angle. The RevolvedHole command creates holes in a polysurface by revolving a profile curve that defines the surface shape around an axis and subtracting the hole volume from the polysurface. Select the hole profile curve. Pick the curve base point. 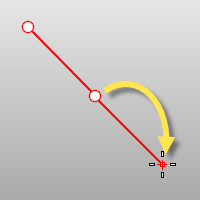 The base point determines the point on the curve that will intersect with the surface and depth of the hole. Pick the location for the hole center. The revolve axis is determined by the start and end of the profile curve. The Undo option reverses the last action.